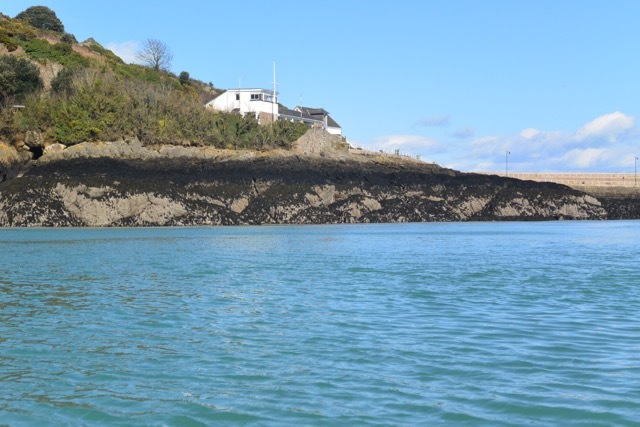 2019 sees some particularly large Spring Tides, offering the opportunity for some rather exciting kayaking. The February tides coincided with a large swell, which presented its own challenges. The swell certainly created some interest during the course of the day but at least the decision to leave from Archirondel meant that we had a relatively quite start and finish to our paddle of north coast speed. 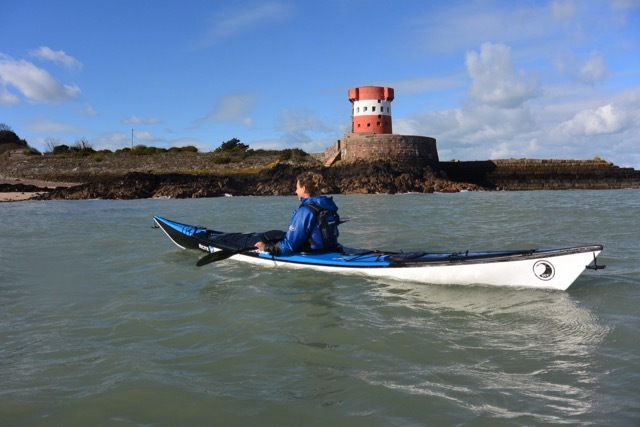 We paddled past the distinctive red and white tower, built in 1792 before hitting the main flow of the ebbing tide. We were on our way. Due to the size of the swell we launch from Archirondel, a beach which we don’t use that often. Perhaps we should because it was easy launching and landing. Our target for lunch was a small beach just to the east of Ronez, we knew that we would be able to land there almost regardless of the size of the swell. In fact we had eaten there a few weeks previously on another day with a large swell. We arrived off Ronez in less than 2 hours. So the options were a 3 hour lunch break, whilst we waited for the tide to turn, or head a bit further along the coast. We chose the second option and carried on towards Plemont, the next place we knew for certain we could land. The closest headland was our target for lunch, the reality was eating at the distant one. This was a result of the speed we were traveling at. We stopped for lunch on a small sandy beach on the eastern side of Plemont headland. Due to the size of the swell this was the only suitable location along this section of coast. Rachel off Le Mourier Valley. We couldn’t approach much closer to the coast because of the occasional large swell, which would sweep into the bay. From Sorel we started to pick up the flood tide, and accelerated along the north coast of Jersey. Belle Hougue, the tallest headland in Jersey. We were certainly moving fast at this stage. Jim breaking into the tidal flow at Tour de Rozel, one of the best tide races on the Island. 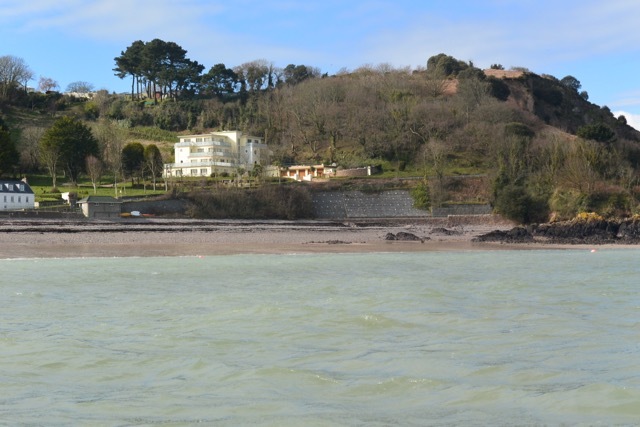 As we left Tour de Rozel, the influence of a large spring tide, was having a distinct impact. The figures on the GPS, were gradually creeping upwards. As we approached La Coupe, the north east corner of the Island we touched just over 10 knots, fairly surprising as we weren’t putting too much effort into our forward paddling. The tide swept us onto St Catherine’s and into Archirondel. We have covered 24 nautical miles during the day but I can’t remember a time when a paddle of that distance had felt so easy. Today was the first day this year that I have been out kayaking off the east coast of the Island. 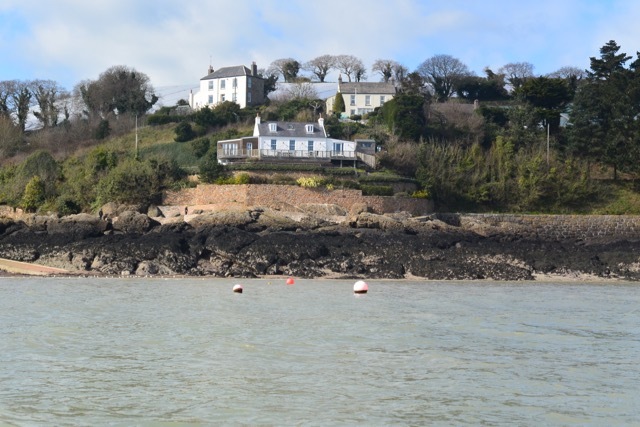 It was just a gentle paddle around the area to the south of St Catherine’s, the base of Jersey Canoe Club. The breakwater is the most visible reminder of a grand project by the British Admiralty in the middle of the 19th century. It was due to join up with the southern arm, which was due to be built out, from the coast, close to Archirondel. On the way south we passed the small cottage, L’Hopital, which was built as a hospital to meet the needs of the hundreds of workers who were employed on the construction of the breakwater. Today it is a private residence. Continuing south the next obvious building has a potential role to play in the tourist industry. The red and white stripped Archirondel Tower. Built in 1792 as part of the Islands coastal defences against the French military it is currently been refurbished and it is hoped that it will be available for hire from Jersey Heritage in the Spring of 2018. This will be a perfect place for visiting sea kayakers to stay. The small headland between Anne Port and Archirondel is interesting from a geological perspective, providing evidence of some volcanic activity in the distant past. The columnar rhyolites are easily visible from the sea but are missed by the thousands of people who drive along the road above. 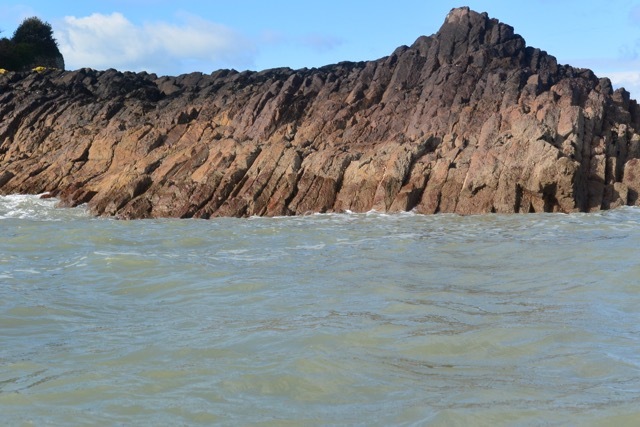 Once past the rocks of the Jersey Volcanic Group we crossed Anne Port, a small bay, which must have seen more attempts at preventing coastal erosion than anywhere else on the Island. The authorities have used rock armour, cliff pinning, netting, beach replenishment, gabions and a sea wall to help prevent erosion, all is needed is a groyne and there would be pretty much every type of coastal protection. L’Hopital is in a superb position, just above the shoreline. The white building is the base of St Catherine’s Sailing Club. Originally it was the carpenters sheds whilst the Breakwater was under construction. Looking into Anne Port. Some of the coastal defenses are visible at the rear of the beach. Paddling past the columnar rhyolites at La Crete Point. There is a much better view from a kayak than from the road. Arriving back at Archirondel. The end of a rather pleasant way to spend a March afternoon.